A very small breed, the Yorkshire Terrier is tiny in size and well known for being such adorable creatures. While they may appear a tiny little dog that would be a great pal for a child, they can get into mischief if given the opportunity to do so. In many cases with smaller dogs, they tend to bode the most personalities, some are rather stubborn and can be a challenge to train even as pups. They have a tendency to be quite forward with other dogs and with other small creatures as well. While they may be avid barkers at first, they can be properly trained to stop with ease. They make exceptional watchdogs, but due to their small stature, they cannot be called upon to be a great protector when needed. Very playful and equally as affectionate as well. One great quality about a Yorkshire Terrier is that they can generally entertain themselves and meet their daily exercise requirements with very little effort from their owners. They do enjoy a game with their families and can tend to crave that engagement from others. 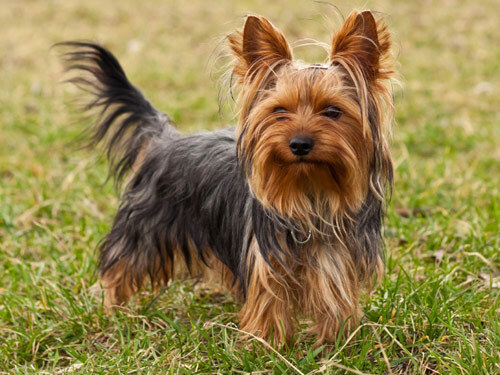 They do love to explore and having a fenced in yard for them to roam around in safely for a it each day would be the ideal living arrangement for the Yorkshire Terriers. It is advised to wrap this type of dog up if they will be engaging in outdoor activities during the winter months as they are not the type of dog that is suitable for colder temperatures. They can function fairly well in warmer climates, but the same attention should be given if the temperatures get too hot. The Yorkshire Terrier does not have to deal with any major health concerns, which is a nice quality to care for them. Some can develop patellar luxation which is a very common health ailment for any type of dog to develop. In rare cases they can also develop Legg-Perthes disease, tracheal collapse, portacaval shunt and PRA. These conditions do not always occur in all Yorkshire Terriers, just some can develop them as they age. To prevent any further illnesses the vet may recommend screening for their liver, eyesight and knees. The average lifespan of this breed is from fourteen to sixteen years long. Generally they weigh less than seven pounds as full grown canines, making them very easy to transport and also to reside comfortably in a smaller space. Deriving sometime in the 18th century, the Yorkshire Terrier is a breed that is a result of a cross breeding with one of many types of Terriers. The Black and Tan, Waterside, Clydesdale, Paisley, Skye and Dandie Dinmont have all been crossed to create various versions of the Yorkshire breed. Due to their heritage deriving from such modest areas, these dogs were not favored by the wealthy or socially elite communities. By the late 1800's, they had been discovered in the United States and the Yorkshire Terriers with their long fur coats became quite popular.